Been a reader for years! Been frequenting the site for years and finally decided to join. A previous employee of my local O-Store and an avid collector since 2008. My first pair of Oakleys was an M-Frame (Polished Black w/ Gold Iridium Sweep) and a pair of Monster Dogs (Brown Fade w/ Gold Iridium) shortly afterwards. 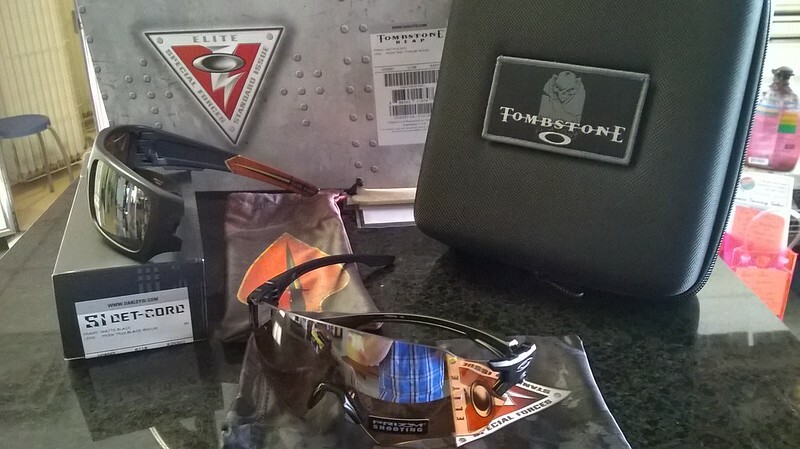 I began acquiring Oakley product in the early 2000's, which lead to my eventual employment at the local O-Store. Two Double-Wides later, I am still obsessed with the brand and the hunt. Does anyone know if there is another nose piece out there that works with Tombstone? Not sure if this has been posted anywhere else, and if so I'll apologize in advance for any unintended duplication. I just received my first pair of Tombstone this week and was not expecting the lens shape for Reap to be so large. By no means is it a complaint, just unexpected. Preferred actually, as I am big fan of the older Heater and Range lens shapes. The lens height for Reap feels close to that of Jawbreaker, with obvious differences in fit, weight and peripherals. I grabbed some other frames to give a reference for size, hoping to help anyone else looking into purchasing right now. I'm curious how much smaller the Spoil lens size is compared to Reap. Few TR offerings. The Arrow edition Detcord, which ended up having TR22 Black Iridium. Then for the Tombstone, I wrestled with getting the array of one, and the Black w/Red accents on the other so I could get all the lenses, and the case. Then I found out even the single colorways come with the case, so I let my financial sense take over, and just opted for the TR45 Titanium Iridium, which is an awesome lens to look at. Reminds me of a tinted Ti Clear...though I suppose that's exactly what it is. Congrats Dann on the great pick-up! I can't wait to receive my order. I got a notification stating it had been received at the local distribution center, so hopefully tomorrow. Has anyone picked up the variant with Black Iridium and the red accents? i'm curious if the embroidery on the vault is the black and red one shown earlier in promotional shots. Also, congrats on the Rolling O shirts Francois and that Double Tap JP! It is hard to gage the size since the individual sporting them has such a narrow face. Overall, it looks like a great replacement for the Garage rock. I'm most intrigued by the hinges. They appear to be a new design, as the metal insert is contiguous and spans the orbital to ear-stem break. The name Latch may be referencing this hinge design. Either way, I'm definitely looking forward to seeing them in person. Francois - That is a beautiful set-up! I like the look and feel of the new 4.0 displays; they go very well with metal line. I couldn't hold back on F&F any longer. I made some small additions at my local O-Store yesterday. Yes it has been a while. It's been a busy couple of months with travel and work commitments. I'm glad to find the time to pull away from the onslaught and reconnect here. Looks like everyone's been busy with some great acquisitions! Golf line Shoe Bag, Packable Rain Jacket, and Luggage Tags. Also, a new Medusa Tee. Beautiful Dann! You beat me to it. I received mine on Friday but I have not had chance to post them until now. I am very impressed with the heft and build quality of this pair, which is great because I am eager for them to retire a long standing go-to of mine, an original Matte Black Crosshair with VR28 Black Iridium Polarized. Also, I had picked up a Uranium Jawbreaker earlier in the month, but hadn't gotten around to posting it. Atomic Orange Jawbreaker is now listed as In-stock online. It is one of the few pairs I haven't physically seen between a local bike shop and the O-store and can't wait to see it in person. Side-bar. Anyone heard anything about the availability of replacement lenses? I ordered a Uranium collection Jawbreaker and want to swap the lens out for Fire Polarized. I love that beanie! I have the exact same one, but it has seen much better days. It was my go-to for a long time in any cold air environment. First pair of Juliets ever! Beautiful pair. I'm glad for you! Picked this up yesterday! Needs a little TLC here and there and I'll take that back white part out and replace it with a mirror. I'm pretty happy with it! Side note... the guy I bought it from says to use black boot polish on the scuff marks on the metal. Is that the secret or is there a better solution? Congrats! Looks great. I haven't ever tried the shoe polish suggestion and am not sure it is cleaning or removing the scuff as much as just covering it up. I would think that blending could be difficult depending upon the lighting conditions. I've had good luck using a small amount of an ammonia based cleaner on the metal, removing the majority of the dirt and scuff marks. I use an industrial grade optical cleaner to brighten up the acrylic/poly panels and doors. Love the bag! Reminds me of the old Tiger and later Shadow Camo that was released on the earlier releases of Rolling Carry On and Carry On luggage pieces. I am on my third one; traveling a lot for work has it's Pros & Cons. Thanks! It doesn't load when viewed on a mobile device, but was able to locate it, no issue on my laptop. I hope the Factory Pilot line apparel makes a more widespread release. Factory Pilot Greg LeMond shirt... the man. One of the reasons I was hooked into Oakley at a very young age. I love the pull over. I don't recall seeing that online. Is that exclusive to bigger or flagship stores? Cost of Mega Tower 3.0??? I don't consider it a deal breaker, just an annoyance or hazard when moving them around. It is specifically the black plastic insert within the metal feet. Thanks! It is something I am VERY grateful for. Good luck. Also, I recommend bringing a dolly/cart and a moving blanket. The feet on the 3.0 are extremely fragile and break, fracture apart when slide on a hard surface. A helping hand is also recommended. I consider anything that came out while Oakley was still using its original logo to be vintage. That's an interesting idea. Where would you consider the Stretch-line logos? I learned that lesson while working at an O-store. I used to talk with local collectors and hear about those they had seen, held or worn and decided to pass on and never picked up. It seems that the most unassuming or seemingly widely available pairs always become the ones you pine over later. I passed up a pair of Copper Pennys for dirt cheap while setting up a new Vault store, simply because they don't fit my face very well. I still regret that to this day. I don't consider that an unfair price, but as has already been pointed out, price ranges vary a lot. However, I do consider myself extremely lucky, having only invested $600 net in my current set-up. I had a 3.0 Mega that became a 3.0 Double, after trading it with a local cycle shop that was down-sizing their product scope. I also found a local shop going out of business and picked up another 3.0 Double for $200. I would make sure you have your priorities and preferences identified ahead of time, as timing is the critical piece here. I missed out on a Brown Sq. O 3.0 Mega based solely on drive time. I couldn't get there quick enough. Agreed. I look at styles like the X Squared and Pit Boss as following much of the pre-Lux design language, which is probably due to the longer development times. I would actually look to the choice in color ways, special edition runs and distribution volumes as having more influence from Luxotica. More of the appearance & marketing of the brand rather than the design of the product. It is an interesting proposal, but I don't know if I agree with the 10 year rule. There are many pairs that fall outside or near that timeframe that share much of the current design language and could easily be sold in today's lineup. I mainly look to the Sq. O collection, most of which is approaching 10 years, including several designs I would have a hard time considering vintage. Counter to that would be how common reissues have become in recent years, some even becoming a modern staple (Frogskins). Of course this was probably to help drive market penetration and to some extent followed popular trends, but it does muddle this delineation if retro is new. I can't say I've given much thought to defining a pair as Vintage or Modern, but I do definitely have a defined boundary for what is born out of the Luxotica acquisition and that which I consider to be pure, original Oakley. Chrome Monster Dog from Doc Chop. That is screaming for a pair of Ti-clear lenses! Always love to see the Monster Dog around. Congrats! Thought it might be useful to start another thread, instead of hijacking an existing, for posting pics of our Madman & Badman displays as well as some suggestions, tips, and tricks for displaying the new Madman & Badman... since they don't seem to fit on the stands like most frames. I love the idea and can already see that applying to various other wire frames (Plaintiff comes to mind) where I've run into the same issue. However, it doesn't change stance of the glasses, sitting lower, something I still can't decide if I like or not. I've been using the metal stretch line stands, which as you pointed out do not fit the pair with the folded ear stems very well. I have them propped with the ear stems extended. This is how the Racing/Water Jacket, Pro M-Frame and other non-folding pairs were displayed when I worked at an O-store. I guess I got used to utilizing them that way. Of course, this only brings out the engineer in me, wanting to design my own stand for the new X-metal line. Agreed! Also, I like your display using a two-tier. I can't decide if I like the old metal stand or the newer circular ones for displaying the Madman. I don't like how low they sit with the bridge point being so high. It does seem to give them a more aggressive stance though if viewed from the side.